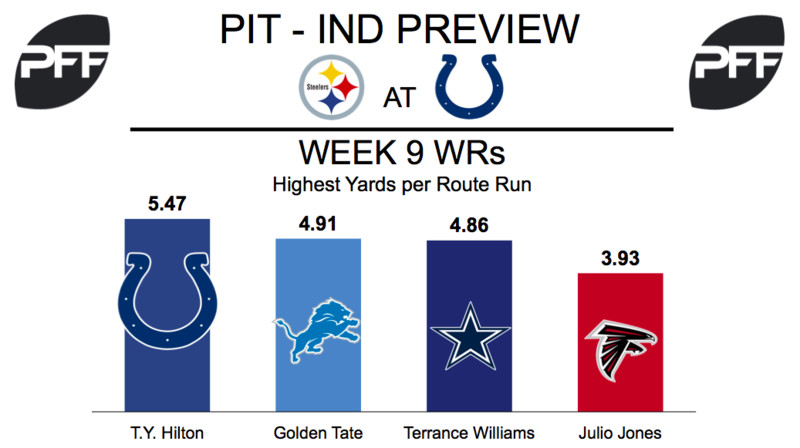 RB Le’Veon Bell vs. Colts’ DL – After a slow start to the season, Bell has graded in the top 10 among running backs in four of the past five weeks prior to the Steelers’ bye week in Week 9. He is on pace for 388 attempts this season, the second-highest total of his career. Bell is one of only four running backs to have forced five or more missed tackles while rushing in at least three games this season, his 30 missed tackles forced while rushing this season are second-most in the league. He will be tested against a much-improved Colts’ defensive line, even with Henry Anderson’s injury. Both Johnathan Hankins and Al Woods have a run-defense grade of at least 83.0. Not a single Colts’ interior defender earned a run-defense grade above 80.0 last season. The duo each rank in the top 10 at their positions in defensive stops in the run game this year. WR Martavis Bryant vs. CB Rashaan Melvin – Known as a deep threat prior to missing the 2016 season, Bryant has had only one reception 20 or more yards downfield this season. But a major part of that is only two of his 12 deep targets have been catchable. That’s fewer catchable deep passes than JuJu Smith-Schuster has on the season even though Smith-Schuster has only been targeted five times deep downfield this season. Bryant was already losing snaps to Smith-Schuster before being suspended for Week 8, playing less than 53 percent of snaps in Weeks 6 and 7. 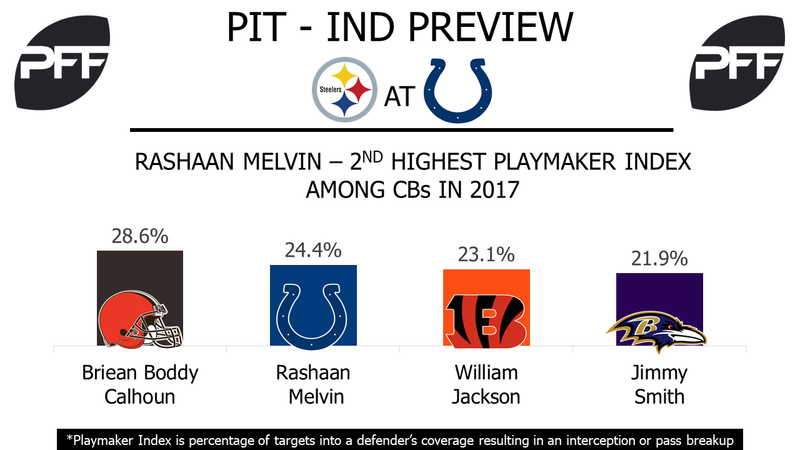 Melvin has a playmaker index, the percentage of targets into a defender’s coverage resulting in an interception or pass breakup, of 24.4 percent in 2017 which is second-highest among cornerbacks this season. T Alejandro Villanueva vs. Edge Jabaal Sheard – Villanueva’s season started off by allowing a sack in five of the first six games this season after only allowing one sack the final 13 games last season including playoffs. He has fared better in the run game with a run-blocking grade of 80.1, ranked 10th-highest among left tackles this season. Sheard is having a career year, ranking in the top-10 among edge defenders in both run defense (fourth) and pass rushing (10th). Sheard is one of only five edge defenders to have 15 or more defensive stops in the run game as well as 35 or more total pressures, showing off how he affects the game in all facets. WR T.Y. Hilton vs. Steelers cornerbacks – Hilton went off against the Texans in Week 9, catching five of his eight targets for 175 yards and two touchdowns- an average of 35 yards per catch. His 5.47 yards per route run led all wide receivers for the week. The Colts’ top receiver will see a number of different matchups in the secondary depending on where he is lined up. When in the slot (37.4 percent of the time), Mike Hilton will be his main adversary. This season, opposing quarterbacks have a 56.8 passer rating when targeting Mike Hilton in the slot. The UDFA has allowed 0.62 yards per coverage snap, third best among slot corners. When lined up outside, T.Y. Hilton will see a lot of former first-round pick Artie Burns. Burns is averaging 13.4 coverage snaps per reception, ranked 25th at his position. T Joe Haeg vs. Edge Bud Dupree – The Colts right tackle had the best game of his young career last week in Houston. His 86.0 overall grade was the highest among offensive tackles in Week 9. The sophomore did not allow a single pressure on 39 pass-block snaps, and was able to get to the second level on a number of occasions in the running game. Pittsburgh’s top left-sided pass rusher is third-year edge defender Bud Dupree. The former first-round pick has struggled in 2017, earning a 45.5 overall grade through eight games. Dupree has accumulated 21 total pressures, while his 9.9 pass-rush productivity places him 30th at his position. T Denzelle Good was activated this week, which means Haeg might see a new position however. TE Jack Doyle vs. LB Ryan Shazier – For the sixth time in nine contests, Jack Doyle led Indianapolis in targets in last week’s victory over the Texans. The tight end caught eight of his nine looks for 63 yards. Doyle’s 63 targets in 2017 is second only to Travis Kelce’s 65. He also ranks second at his position with 50 receptions. On the season, 1.78 yards per route run is seventh best among tight ends. On the other side of the line, Ryan Shazier is enjoying a fantastic season, leading the Steelers defense. Shazier ranks fifth among linebackers with a 88.5 overall grade this year, and his 85.9 coverage grade is the best on his team. When targeting the speedy linebacker, opposing quarterbacks have a 75.7 passer rating. This is the seventh lowest mark at his position.